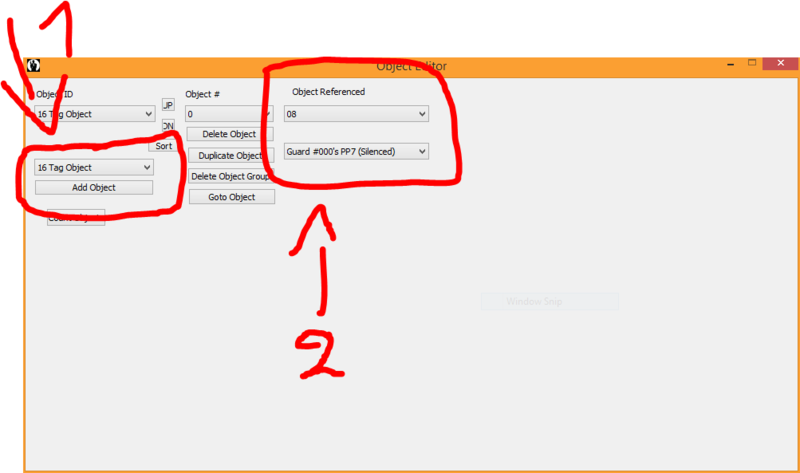 go to objects, add a key, make the preset "attached to guard", and then select the guard. If you want to use it within action blocks, make sure to give it a 16tag. If I didn't explain this well enough, please say so. Hi again i would like to know how to rename items and the pick up texts. If you add a 25 Rename type to your setup in the Edit Objects menu, you can rename items. If it is a specific item, like a key / keycard, you will need to add a 16-tag to it (object type). You choose the item you are renaming, the image you want the watch inventory to show, as well as the new names and interaction text (Picked up a...). You will need to add this custom text to your level L_E file (such as LarchE for Archives), and put it into into your ROM. If not, the text will not appear, or the mission will crash when that text is being loaded. Check out a level like Facility to see how Rare setup the keycards, and even the console activation text. first you add a 16 object as shown in the image, and then you select which object needs to have the 16 tag. You will need to import your custom text file inside the Game Configurations menu. Under Stage Options, you choose the level you are modifying. It will show all the files it uses (setup, multiplayer setup, clipping, background, briefing and text). There is a small square button next to each thing. Click the button next to the text file name. For example, Facility (ID 23) uses LarkE. When you do that, it will select the text file from the file library at the lower area of this menu. You should see a button that says something like "Inject File and Upd Tables". When you click it, it will ask you to find your file to replace it with. After you do, save your ROM and test out your mission. Make sure you load your custom ROM before making the change, and save under a new name to keep backups as you make progress.